BAUDIER -The History of the Court of the King of China [with] An Account of the Empire of China. . .
BAUDIER, MICHAEL & FRAMPTON, JOHN - The History of the Court of the King of China [with] An Account of the Empire of China. . . 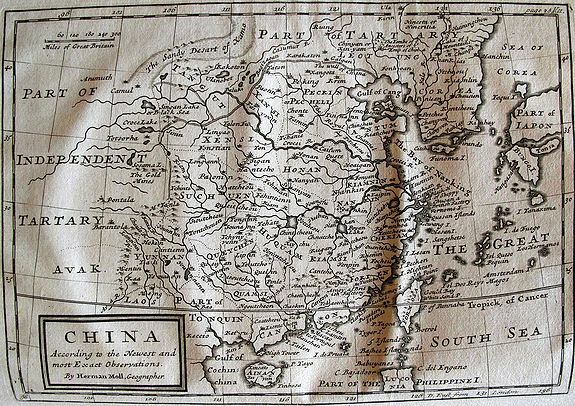 Title : The History of the Court of the King of China [with] An Account of the Empire of China. . ..
Map maker : BAUDIER, MICHAEL & FRAMPTON, JOHN . Size : 14.0 x 11.8 inches. / 35.6 x 30.0 cm. Description :Complete account extracted from a contemporary collection of voyages in French and Spanish and translated into English. Includes a map of China by Herman Moll.